In 1999 I became so frustrated with my own Bible study that I determined that I was not going to read the Bible any faster than I could understand it--at least to some reasonable level. My frustration was that after 50 years of age I was not seeming to learn new things in study but was simply seeing the same things I had many times over in previous years. If course I could imagine what God was saying in scripture, but I wanted to understand what he had to say, not what I imagined he was saying. I turned to Matthew chapter one to begin and it was about 14 months later that I finished reading this single book of only 24 chapters. This probably involved almost 500 hours of study. Without a better method I simply began to read a chapter or section at a time over and over again until I began to understand the overall themes and messages. It would not be unusual to read each chapter 15 or 20 times while taking my own notes before I would move on to the net one. What began to happen is that I would see similar or related concepts between passages, chapters or even multiple chapter sections. I was beginning to understand underlying themes in the New Testament Gospels I then referred to as God's Sermons. I found that The book of Matthew had about 24 sections that did not fall on chapter boundaries that each formed a sort of sermon. They began with an introduction statement which stated somehow what the teaching was about; then an example such as a parable or historical event; this was followed by a teaching about the event; and then the section ended with sort of a moral or closing statement of the section. Following are listed five of these sections of the Book of Luke. So this discovery began to open my eyes to patterns in the Bible we were not aware of. I became so excited about these "sermons" in scripture that I began studying and writing about them. This drew me deeper into the study of God's Word. Following is a brief overview of one of what I believe to be God indended section teachings in the Gospels. From Luke 10:25 to 11:13 is an organized teaching including an introduction, teaching statement, examples and a closing statement that reinforces the teaching. THE OPENING -- Someone asks - What do I need to do to have eternal life? 10:25 And a lawyer stood up and put Him to the test, saying, "Teacher, what shall I do to inherit eternal life?" 10:27 And he answered, "YOU SHALL LOVE THE LORD YOUR GOD WITH ALL YOUR HEART, AND WITH ALL YOUR SOUL, AND WITH ALL YOUR STRENGTH, AND WITH ALL YOUR MIND; AND YOUR NEIGHBOR AS YOURSELF." 11:9 "So I say to you, ask, and it will be given to you; seek, and you will find; knock, and it will be opened to you. 11:9 "...ask, and it will be given to you; seek, and you will find; knock, and it will be opened to you. 11:13 "If you then, being evil, know how to give good gifts to your children, how much more will your heavenly Father give the Holy Spirit to those who ask Him. As I was concentrating on studying the sermons I began noticing other patterns that I for a long time rejected -- That numbers seemed to have a pattern as well. Not only numbers in the text but chapter and verse numbers. I did not know what this meant when I first noticed them, but they were the beginning of years of an ever so gradual process of learning about God's Redemption Pattern and Numeric Map. Here is one of the most amazing early finds that caught my attention. It may not be meaningful to others but seeing it made me believe I was looking at more patterns that were not just coincidence. I've always questioned my understanding of the eye being the Lamp of the Body until one day I happened to notice (or God showed me) the relationship between the verses at Luke 11:33-37 and 12:33-37. Five verses that lined up on the same verse numbers in chapters next to each other. Each of these five verses helps in understanding the counterpart verse in the other chapter. In my mind they match up perfectly. When examining them together they illuminate each other. At first I just noticed the similarity in the text and how one set help explained the other--but then I went to write down what I found and I was almost shocked to find they shared the same verse numbers. Of course, this could have been coincidence but it was one of many little clues that there might be more to chapter and verses than I was taught. Following is a brief explanation of one of these best early examples. Verses in Luke 12 directly correspond and help explain corresponding verses in Luke 11. When you study each set in context of one another you can see the picture of Jesus being the Lamp of the Body and we are to have his lamp inside us (Holy Spirit?) when he comes for us. The strongest clues for these sets of verses intentionally lining up is verse 37 and 38. First, 37 contrasts how the Pharisees asked Jesus to recline vs how Jesus will come ask us to recline. Then in 38, the Pharisees were surprised when Jesus did not wash to be ready for the meal vs how when Jesus comes those who are ready will not be surprised. Luke 11:33 No one lights a lamp and puts it in a place where it will be hidden, or under a bowl. Instead he puts it on a stand, so that those who come in may see the light. May also correspond to Luke 12:33, but only shown here as a help to put it all in context. Luke 11:34 Your eye is the lamp of your body. When your eyes are good, your whole body is also full of light. But when they are bad, your body is also full of darkness. Luke 12:37 It will be good for those servants whose master finds them watching when he comes. I tell you the truth, he will dress himself to serve, will have them recline at the table and will come wait on them. (Jesus invites us to recline at the table. We are not the ones to do the inviting of him to come to us. We accept his invitation). 11:38 But the Pharisee, noticing that Jesus did not wash before the meal was surprised. (The Pharisee who was judging Jesus’ acceptability to him, will be surprised). 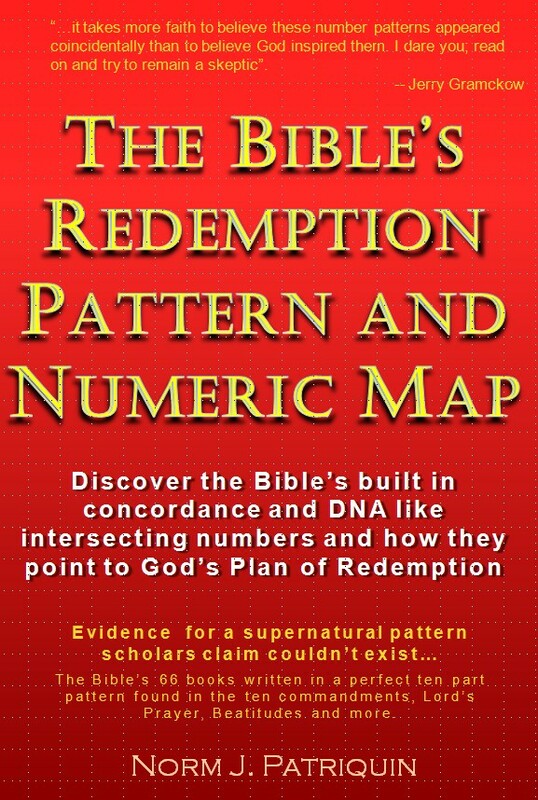 The discovery of The Bible's Redemption Pattern and Numeric map involved literally 1000's of small observations that all continually pointed to the existence of patterns between numbers and text. None of the examples by themselves could be considered proof, but the preponderance of so many of them demanded only one conclusion -- God had inspired book, chapter and verse numbers and lined up the text of scripture such that they may illuminate each other. Only a supernatural God could have developed the Bible with this incomprehendible perfection.